One of our jobs those first days after my daugh­ter Sarah died was to cre­ate a pro­gram for her memo­r­i­al ser­vice. 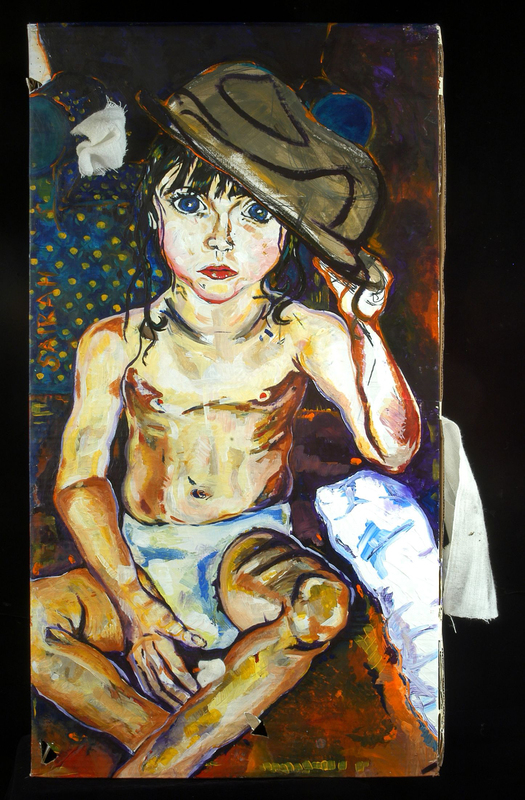 For the cov­er we decid­ed to use a por­trait of her as a baby, which Sarah paint­ed when she was four­teen years old. She had recent­ly told me how she loved this paint­ing because it remind­ed her of a per­fect time in her life. There was a small piece of her beloved “mom­my blan­ket” affixed to the paint­ing. I, too, love this paint­ing. Sarah’s paint­ings, with­out ever study­ing the peri­od, were some­how rem­i­nis­cent of the ear­ly mod­ernist Ger­man Expres­sion­ists. Her brush strokes were expres­sive, done in what appears to be long, sweep­ing move­ments. Bold col­ors, often applied in star­tling com­bi­na­tions, cap­ture facial fea­tures, hands, or arms. But in most of her paint­ings, the eyes are the dom­i­nant fea­ture. She paint­ed friends, fam­i­ly mem­bers, or ordi­nary peo­ple found on the street, plac­ing them in set­tings that revealed some­thing about their lives or who they were. She nev­er want­ed her por­traits posed, nor made to look too per­fect, appre­ci­at­ing the beau­ty in flaws and imper­fec­tions. I couldn’t imag­ine her fret­ting over how some­one should sit. Instead she would work from instinct, paint­ing the fig­ure on the left or the right side of the can­vas, nev­er in the cen­ter, shift­ing the bal­ance of the image to keep it more inter­est­ing. This is true in all of her paintings—that is, except for that self-por­trait of her­self as a baby. Here she sits in her dia­per, front and cen­ter, fill­ing the can­vas. The sub­tle shad­ing of her arms, legs, and tor­so allow you to see the mus­cu­la­ture of her ribs and joints. But, as always, it is the expres­sive blue eyes that grab you. Even at such a young age you can see there is more to the pic­ture, a greater depth of thought and feel­ing, some­thing on the tip of her tongue she wants to tell you. Her brown der­by hat, which belonged to her Aunt Karen, sits poised atop her head. She tips her hat to you. My sis­ter Karen sug­gest­ed we bind the pro­gram with col­or­ful yarn, because Sarah often wrapped her dread­locks in a rain­bow of yarns. But a day before the ser­vice, we ran out of yarn and couldn’t fin­ish the pam­phlets. My sis­ter Car­ol offered to go to the neigh­bor­hood store to buy more yarn. I was like a lost dog that had found a mas­ter. I was afraid to be alone, afraid I’d be lost, afraid of what I might feel if actu­al­ly left alone. So when Car­ol jumped up, I rose too, numbly, and fol­lowed at her heels. Car­ol and I head­ed to Bruce Vari­ety, a store brim­ming with every­thing from craft items to under­wear to ham­mers and nails. If Car­ol went up one aisle, I went up the same aisle. If she turned back, I fol­lowed her back down. If she stopped, I bumped into her back. Maybe around the third or fourth aisle, I came across a large dis­play with the words “toe sep­a­ra­tors” writ­ten in bold let­ters across the top. I stopped short, read­ing the descrip­tion of this new prod­uct over and over. I even allowed Car­ol to walk out of my line of vision. I couldn’t move on. Here was a tru­ly amaz­ing product—toe sep­a­ra­tors. I had always been a lit­tle unhap­py about my close-set toes, espe­cial­ly the two that over­lapped. Now, here was a prod­uct I hadn’t real­ized I had been wait­ing for all my life. Some part of my brain must have remem­bered the hours my sis­ters and I had spent togeth­er, paint­ing our toe­nails out­landish col­ors of pur­ple or blue, admir­ing each oth­er and then care­ful­ly sep­a­rat­ing our toes so as to not to dam­age our hand­i­work. Footie work. In the moment, though, it was as if I had nev­er seen them before. This was sal­va­tion in a small plas­tic-wrapped pack­age. Yes, I, too, could now have straight toes! I couldn’t believe my good for­tune. She found me and looked quizzi­cal­ly at the dis­play, then at me. Her voice was soft, the voice of a kind par­ent who’s hold­ing tight to a peb­ble a child plucked from the ground. “Yes, they are amaz­ing.” Car­ol sweet­ly kept reply­ing to each of my procla­ma­tions. “Per­fect for you,” she said. “Yes,” she said, “you should get two pairs,” as she pulled a sec­ond one off of the dis­play. I tagged along to the reg­is­ter, stood in line next to her, hard­ly able to wait for the cashier to ring them up so I could grab them before los­ing them to the bag. We traipsed back to our car. Car­ol was bare­ly in the driver’s seat before I was unwrap­ping the pack­age, chat­ter­ing away. “Car­ol, just look at these!” I pulled off a shoe and then a sock, placed my foot up on the dash­board and slipped on my new, very own, toe sep­a­ra­tors! Oh. I peered down at my feet and sud­den­ly saw these ridicu­lous pink spac­ers between my toes, mak­ing me look like a webbed-foot­ed pel­i­can. I noticed the burn­ing heat of the black dash­board under my feet, then a dog loud­ly bark­ing in the car next to us. I took in the peo­ple pass­ing by in front of our car. I blinked slow­ly, as if the sun­light had been turned a notch too bright. It dawned on me that I was out in the world—a world I bare­ly rec­og­nized any­more. I couldn’t take in the life that was brim­ming all around me. See­ing peo­ple do ordi­nary things—going to lunch, shop­ping, walk­ing dogs. As if life were exact­ly the same. Didn’t they know it wasn’t? Car­ol, still not sure if I had returned to myself, gave a ten­ta­tive laugh. I wrig­gled my toes. I wrig­gled more. “Much, much bet­ter,” I said. Now we were both laugh­ing. We laughed the entire fif­teen-minute dri­ve home. Dou­bled over, wip­ing the tears of laugh­ter, or so I thought they were. My hus­band, hear­ing us from the house, came out to see what the com­mo­tion was. He stuck his head out the door—what dis­as­ter was this? He saw Car­ol and me, red with laugh­ter, as I held on to her arm wad­dling along in my toe sep­a­ra­tors. In writ­ing “Toe Sep­a­ra­tors,” excerpt­ed from my mem­oir Ghost­moth­er, I am try­ing to cap­ture the ini­tial dis­ori­en­ta­tion I expe­ri­enced after the death of my daugh­ter, Sarah. At that time, my thoughts and feel­ings were a jum­ble, my brain flood­ed with over­whelm­ing and chaot­ic tor­rents of emo­tion. My mind, refus­ing to accept or inte­grate such an event, kept say­ing, “This can’t be.” I want­ed to por­tray this state of con­fu­sion, where I felt caught between two worlds: in one, Sarah was still there, a specter just out of reach, and in the oth­er, the world was irrev­o­ca­bly changed and ren­dered near­ly, unrec­og­niz­ably void. I also want­ed to bring in the idea that even in moments of des­o­late grief, humor can pro­vide solace. And maybe, most impor­tant­ly, I longed to find a way to bring Sarah’s art into my writ­ing so that a read­er could not only know my loss, but also see for her­self Sarah’s cre­ativ­i­ty and tal­ent. Ker­ry Led­dy is a psy­cho­an­a­lyst and writer in Potomac, MD. Her work has appeared in The New York Times, The Wash­ing­ton Post, Huff­in­g­ton Post, Zone 3, Wash­ing­ton­ian Mag­a­zine, and Voic­es. She is the co-author of Wear­ing My Tutu to Analy­sis and Oth­er Sto­ries (Colum­bia Uni­ver­si­ty Press, 2011) and editor/author of The Ther­a­pist in Mourn­ing: From the Far­away Near­by (Colum­bia Uni­ver­si­ty Press, 2013). She is cur­rent­ly work­ing on her mem­oir, Ghost­moth­er.